My current lifestyle doesn't leave many openings, at least not regularly, to take "unplanned, aimless" walks or to amble "with a complete openness to the unknown." To be more forthcoming, I don't get to wander by myself though I participate in my children's wanderings! 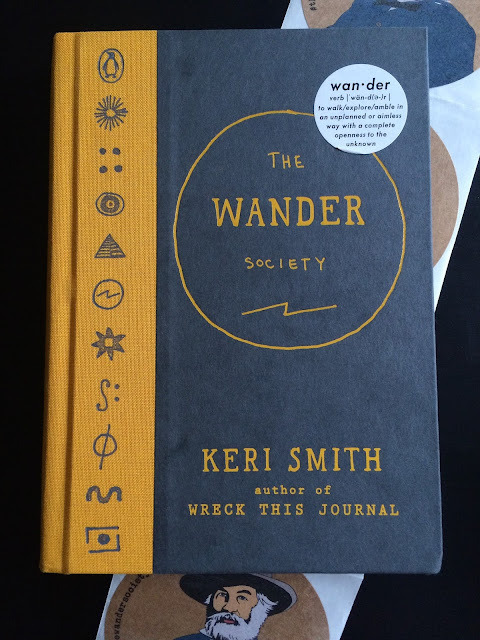 When Penguin Books reached out to me about Keri's Smith's new book, The Wander Society, I saw it as an opportunity to read a new-to-me author and to make room to wander. In The Wander Society, Keri Smith's chronicles her discovery and exploration of the "small anonymous organization" known as the Wander Society and its mission which is inspired by Walt Whitman. Smith uses several sources to write the book including an annotated copy of Walt Whitman's Leaves of Grass, Google searches, publications left in Wander Society message stations and conversations with Professor J. Tindlebaum, a Wander Society scholar. The book is designed with an eye to portability. You can take it on your wanderings. It is compact at about 5 inches by 7 inches. It is hardbound so you don't have to worry about damage while it is jostled among other items in your bag. 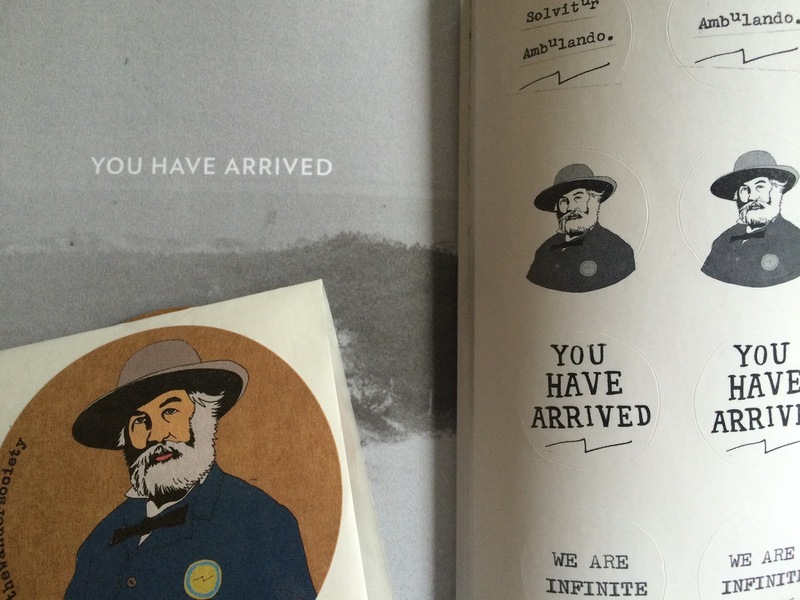 The book is packaged with stickers and badges. I find that one is never too old for these types of flare. In addition to its physical design, the book is well organized. There are the conventional parts of a book, the Introduction and the Foreword, but these are followed by a Welcome and a wanderer's manifesto. From there, the book is divided into five sections -- theory and history of wandering and a list of famous wanderers. Their micro-bios are on pages 38-51. The "incomplete list" includes Walter Benjamin, Michel de Certeau, Langston Hughes, Thich Nhat Kahn, Rebecca Solnit, Gary Snyder, and Virginia Woolf. The section titled "The Wander Society Tactical Guide" concerns itself with a caution about the use of technology, the importance of observation and being invisible, and developing skills that increase your self reliance. In "Wandering Initiation", Smith describes creating a portable research station, designing a uniform, choosing a talisman, and crafting a rest and meditation practice. Smith notes that outside of urban settings, "wandering is viewed as socially unacceptable or is frowned upon." In cities it is easier to wander because the dominance of pedestrianism masks the activity. In more car-centric landscapes, wandering can provoke suspicion. This is especially the case when it comes to adult wandering. Adults may have lost the skill or inclination to wander. Certainly, there is reluctance to let children wander; when these childcare become adults, they don't have a wandering practice. For these reasons, the section about Assignments/Research/Field Work is the most useful part of book. Prompts and nudges are important factors in behavior modification and creativity. Smith provides 29 ideas for how to conceptualize a wandering session. The final section is a straightforward how-to guide. Make your own badges, notebooks, etc. The back matter includes a lexicon, quotes, a creed, and a symbol key. The book concludes with Smith's friend R's quest to discover the identity of the Wander Society in Brooklyn. I won't write more than this. Leading up to R's story are Smith's observations which mostly transpire in the endnotes of each page -- a clever device. If you are inclined to or curious about wandering, I recommend The Wander Society. Check out Keri Smith's website as well as see what other wanderers are up to with the hashtag #TheWanderSociety. I am pleased to announce that one lucky reader will win a copy of The Wander Society by Keri Smith. To enter, answer the following question in the comment section: what tool would definitely be in your portable research station (excluding your cell phone)? The giveaway ends on Friday, April 15th at 6 pm Saturday, April 16 at 11:59 pm EST and one winner will be chosen at random. The giveaway is open to residents of the U.S. only. The winner will be contacted via email and announced in this post. This giveaway is closed. The winner has been notified. I can't believe I am the first person to comment! What a lovely post and photos. I am a friend of Kelly Brenner and a fellow nature blogger like both of you. So happy to find more of our kind! I would take a note book and pen into the wanderings. For as much as I would also want to include my binocs, I know I would forget whatever I wanted to jot down once the moment passes. A note book and pen are my "always" tools, even in the everyday. That's tough, I changed my mind from absolutely my hand lens to absolutely my binoculars until finally stopping at, absolutely my camera. Wandering often produces my best and most interesting photos. A hand lens to wander amongst the tiny. My moleskin journal and pen. To record onservations and draw sketches. Wonderful post! Thorough,but it doesn't give anything away. I find that I always like to keep small glass bottles with me, in order to collect things for crafts, or samples to look at under a microscope(swamp water for example). You never know what you are going to find, so its good to be prepared just in case! I don't think I would bring anything. If I am truly wandering then I wouldn't want anything to distract me from it. If any magical event would occur then I would want to be 100% in that moment. Nothing that I would use to document that experience would ever help me relive it, so in return I would enjoy the time I have with it. Essential tool in my portable research kit? Such a good notion I thought about it overnight. First literary thought: some ziplock sandwich bags, as in "Everything is Illuminated," consummate field research memoir. First thought of a visual thinker: true pocket camera, which earns a pocket of its own. (Manual settings permit depth-of-field photographs that call out plants from their surroundings.) Paper person's first thought: sticky notes, the small ones, to tag active pages in field guide or notebook. Spares the thumbing-through. Nostalgic thought, kit of my 20s: water thermometer to judge what too-cold-to-swim really means. Parental thought: tissues. Final thought: inspired by everyone who posted before me. Thank you!